There are several excellent published title histories available, both in print and on the web. Two of our favorites are Wrestling Title Histories by Gary Will and Royal Duncan, and Great Hisa's Pro Wrestling Title Histories on the web. None that we've found, however, list a complete and accurate history of the Mid-Atlantic titles. Wrestling title histories are extremely hard to put together to begin with, since official records were rarely kept years ago. We have great respect for anyone undertaking this endeavor. 1. David Chappell's extensive collection of audio tapes (as well as a collection of audio tapes that once belonged to Leslie Johnson), some 400 strong going back to 1974. This allows us to document changes in titles as they were communicated on television, the primary promotion tool used territory wide. This will be the first time much of this information has been available. 2. We also have been blessed to have the assistance of Mid-Atlantic historian Mark Eastridge who has done exhaustive research on all cards held in most every Mid-Atlantic Wrestling city. His clipping collection of newspaper ads and results is simply amazing, and has proven to be best help we've had in tracking down illusive title changes. The newspaper clippings, along with local TV promos inserted into the syndicated shows, were the primary promotional tool used locally. One of the most significant errors we've found in other title histories, both in print and on the web, is the first title win by Ric Flair over Wahoo McDaniel for the Mid-Atlantic championship. All of the title histories we've read have Flair either winning the Mid-Atlantic title from an unknown champion in mid-1975 (following Johnny Valentine) or for the first time from Wahoo McDaniel in 1976 following Flair's return from the Wilmington plane crash. Neither is correct. Flair actually first won the title on September 20, 1975 in Hampton, VA from McDaniel in a hair vs. title match. It is the first known match where Flair put up his hair as a stipulation in a match. This was two weeks before the plane crash. Flair held the title throughout his time off recuperating from injuries suffered in that crash, the 30-day no-defense rule was basically ignored. This title change was isolated using both methods listed above, with audio promos leading up to the hair-vs.-title match in Hampton, and the newspaper clippings from the shop. We are working through the slow process of trying to isolate and confirm every title change in Mid-Atlantic Wrestling, and are also working on documenting the Eastern Heavyweight title and Atlantic Coast Tag Titles, each the forbearer of the Mid-Atlantic and Mid-Atlantic tag titles respectively. Most published historical sources (including Hisa's Title Histories, Wrestling-titles.com, Will & Duncan, etc. ), are missing or list incorrectly many of these changes. We appreciate the help of others in tracking down and isolating specific title changes that history failed to clearly record. The lack of any official published title histories by Jim Crockett Promotions makes this task very difficult. And even if they were available, they would also likely be filled with errors. For example, Mid-Atlantic Wrestling Magazine, which was published by Crockett Promotions, usually featured a current champions list in each issue until late 1977. There are several inaccuracies within these issues. Example: Volume 2 Issue 1 incorrectly lists Ric Flair's first Mid-Atlantic Title win as August of 1975, when it was actually on September 20, 1975 in Hampton, VA. Another example: the same issue incorrectly lists Angelo Mosca's TV title tournament win as April 11, 1976 when it was actually April 14 in the studios of WRAL TV. What makes us so sure on our title histories? Well, you're never 100% sure with wrestling title histories. But we plan to present, where possible, some form of documenting evidence for every Mid-Atlantic area title change where possible. When we are aren't sure of a date, we'll narrow it down to a range, and when we just don't know, we'll say so. If you believe any of our title information to be incorrect, please contact us. We want to be challenged, because our ultimate goal is to be 100% accurate. That's something thought to be impossible by anyone who seriously tracks down pro-wrestling title changes. But we are going to keep working towards that end. 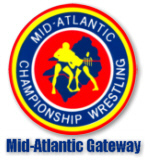 If you have any additional information about the Mid-Atlantic titles that could help us in this quest, please contact us at The Mid-Atlantic Gateway. Special thanks for the contributions of Mark Eastridge, Allan Barrie, Sam Finley, and Carroll Hall, who have assisted David and I greatly in our title histories.